Your business is built on Recurring Revenue – Metricsco ensures that it keeps recurring. Use Decline Recycling Strategies to automatically reduce churn, and Predictive Analytics to identify when customers are about to churn and take relevant action. Identify cross-sell and up-sell opportunities to increase engagement and Customer Life Time Value. Build, Optimize & A/B test Decline Recycling Strategies without I.T. Our powerful drag & drop Decline Recycling Strategy builder lets you create strategies without any help from a technical team. We have created a set of strategies that you can use out of the box and test on your terms and timeline. 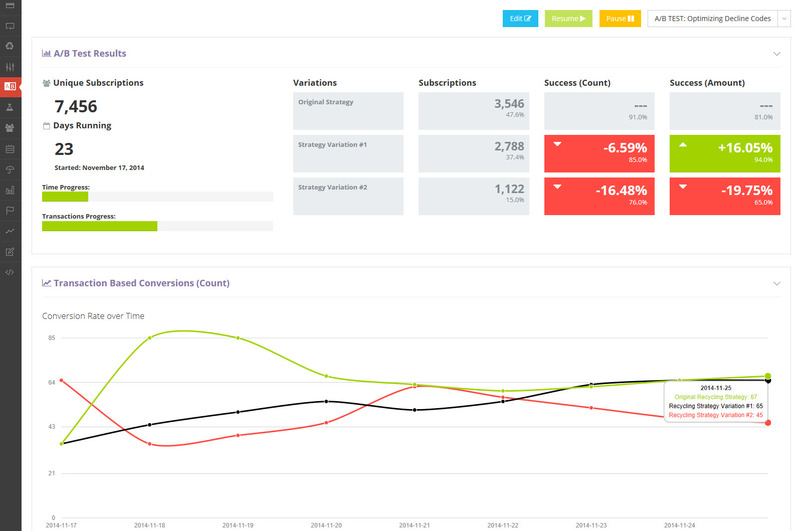 You can also create your own and test different versions of your decline recycling strategies to continuously discover the best performing versions that increase recurring revenue and minimize churn. The most advanced Dunning Communication Management platform ever for mobile and the web. 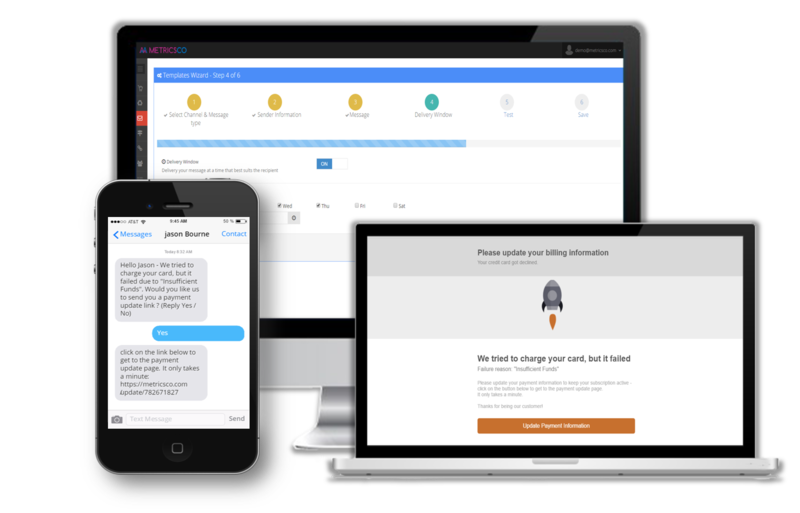 Our powerful, flexible, and interactive platform lets you use targeted, automated messages when payments fail, and re-engage people that slip away. Automatically send email, text messages to people who involuntary drop-off to get them back on track. 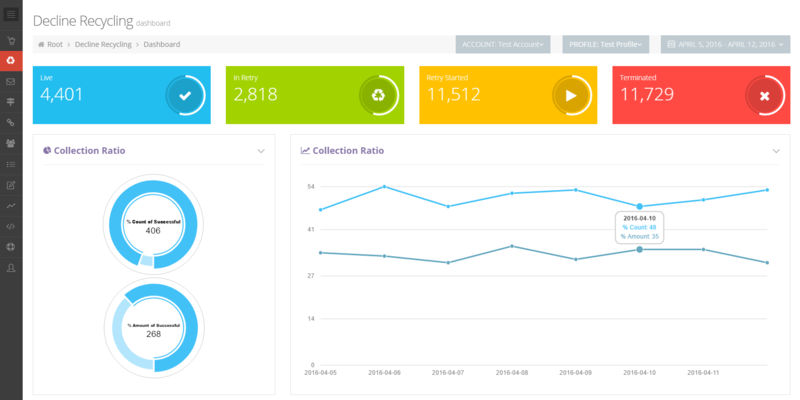 Metricso is the easiest way to find and fix all the leaks in your subscription management and increase recurring revenue instantly. So what does Metricsco include? Optimize your decline recycling strategies in real-time with the utmost flexibility. Create retry plans and assign to the right error code, price point, payment processor, or utilize more than 50 other compare parameters. When a card is declined for any reason, Metricsco sends a message to your customers, letting them know what the issue is so that they can update their card and keep their subscription alive. Having multiple ways to contact your customers when payments fail is essential. Contact your customers via email, text message, or integrate to any other channel via our Web-hooks notifications. Route transactions to the best acquiring bank to ensure maximum payment success.. Enable customers to update their credit card information, securely and without the need to log-in. Easily integrate with our API or use one of our out-of-the-box Connectors to Stripe, Braintree and others.